Few of them are so obvious you’d be surprised people still make them! Yes, the idea is not to override the video with a lot of text. In that case it would affect the aesthetics and beauty of the video content instead of helping audience retain the content better. The text you add has to merge in well with the theme of the video and add to its aesthetic appeal. While it’s important to preserve the aesthetics of the video, the primary reason you wanted to have text on video in the first place is to improve the audience’s ability to retain the content better. Keeping that in mind, it’s critical to place the text in a way that it’s easily readable by choosing the appropriate text attributes like color, font, size etc. One of the best examples of text done right on videos is title of “Thirsty For” videos made by Tastemade. The title blends in really well into the video adding to the already mesmerising video shots; they are also presented in a legible manner that you can read and comprehend without much difficulty. Now, achieving a good balance between aesthetics and legibility while adding text on videos is not very tough, but you should avoid some obvious mistakes when doing that. 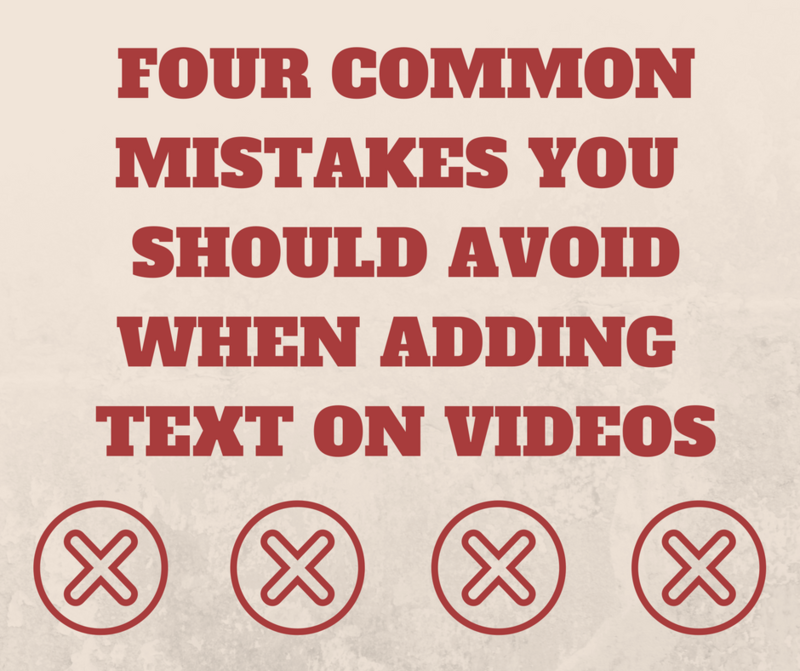 I want to talk about the most common mistakes people make when adding text on videos. Color of text you add on a video should contrast well with the video content. It’s important for the reader to be able to grasp it without a lot of strain. In this case, the black text probably is not as worse as a green or blue (they would’ve merged with the background! ), but is still in the same color range as them. This hampers readability and doesn’t help much with aesthetics. A bright color or white would do a great job here. This is straight forward. You need to evaluate what importance the text carries. If it’s supposed to be a sub-title, you could keep it to the bottom and maintain a small font size. In case of a title, like in this video, the text size can be 3-4 times bigger. Unlike a sub-text, the audience shouldn’t miss it under any circumstances. Many people tend to keep text really small thinking it would hurt the video output otherwise. If you think the message is important, it should be big and bold out there on the video. You would have noticed that the text that’s added on the ‘wrongful’ video clip sits on the left bottom corner. Looks fine right? While your intention might have been to keep it to the corners so that the video content is not perturbed much, you might end up making a big blunder there. Never add text or other motion graphics in the top and bottom 10% of the video. In many web-based video players, including YouTube, this area gets covered by video player controls (timeline, play-pause buttons etc) and your already small-sized black colored text completely gets missed out. Positioning the text is very important. If it’s very critical like a title, position it right at the center and have no qualms about it. If it’s an assisting annotation, position it to the left or right side towards the top in the bottom 2/3 of the video. “Did I miss something?”. Yes you most likely missed out on that text animation because it was on screen only for 2 seconds. Always make sure that you give enough time for audience to read and comprehend the text you add on the video. If you fail at this, the very purpose of adding text on video goes for a toss. Please do not keep movie sub-titles as a good reference for text duration. In most cases, movie subs don’t have an option to be on screen for a long time because of the high volume of dialogues. A good practice to follow is to keep the text for 2 seconds more than the normal reading time. In case of text that is expected to sync well with some events in the video (eg. keep the title till the scene gets cut), you don’t have to go by this rule. Enable the audience to grasp and retain the message well. As you can see, I’ve used white text since it stands out well like in most videos (Fact: It’s tough to produce absolute white color in naturally captured videos). I’ve used Chewy font with a big size so that it stands out bold at the center of the video area. You can also see a quick improvisation done with the location icon that I downloaded from Flaticon – one of the best repositories for icon graphics. The graphics is also kept for approximately 5 seconds so that the audience get time to grasp it well. This was created using Typito, online video editor that enables you to add text on videos in a few seconds. Hope this blog post helped you with the most basic guidelines to keep in mind while adding text on videos. Do share your experiences adding text on videos using the comments section below. Looking forward to hear your thoughts about adding text on videos. is there a way to change the font size? or only by manipulating the text box? As you’ve rightly said we enable change of font-size by dragging and changing the size of the text box! Here’s a quick tutorial that explains the steps – http://help.typito.com/en/articles/5.